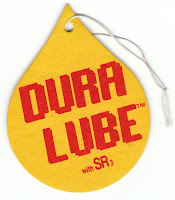 When K-Y Jelly won't do the trick, you can always turn to Dura Lube! And in the form of an air freshener, no less. Maybe it's just the sophomoric side of me, but I've always found anything with the word "lube" in its title kind of funny. Check out other Gallery entries such as "Lube Help Wanted" and "Super Lube."